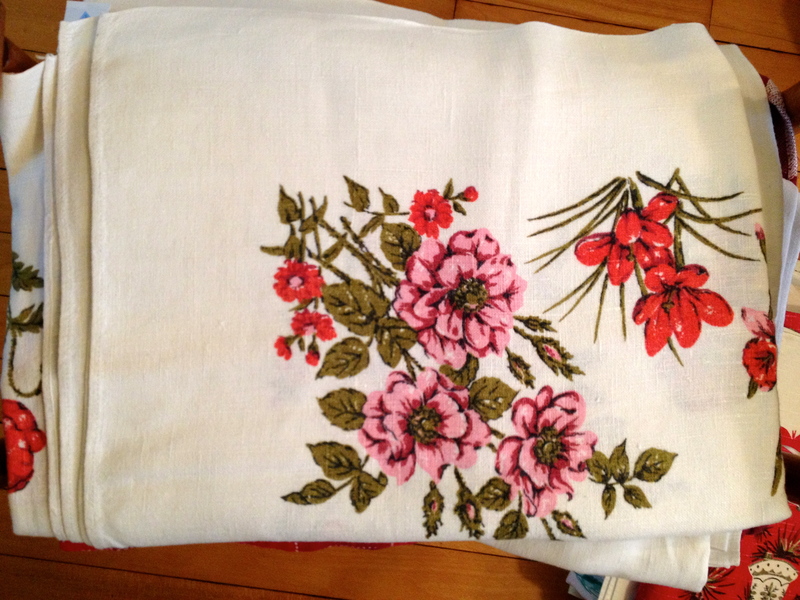 A linen towel with thick satin-stitch embroidery. Not the most delicate work, perhaps, but the colors are pleasing. 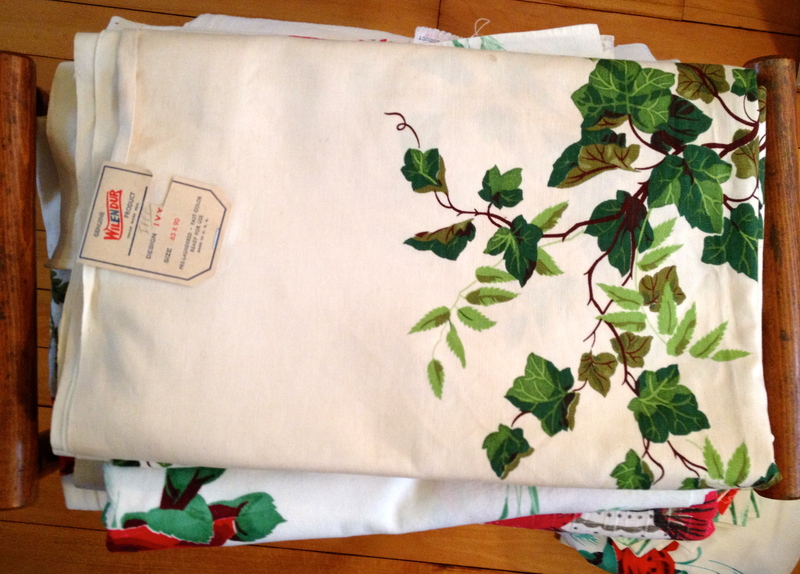 A cute cotton farm tablecloth with veggies and chickens and square-dancing couples. Cheerful pink daisies! Maybe this is a Wilendur? There’s no tag. 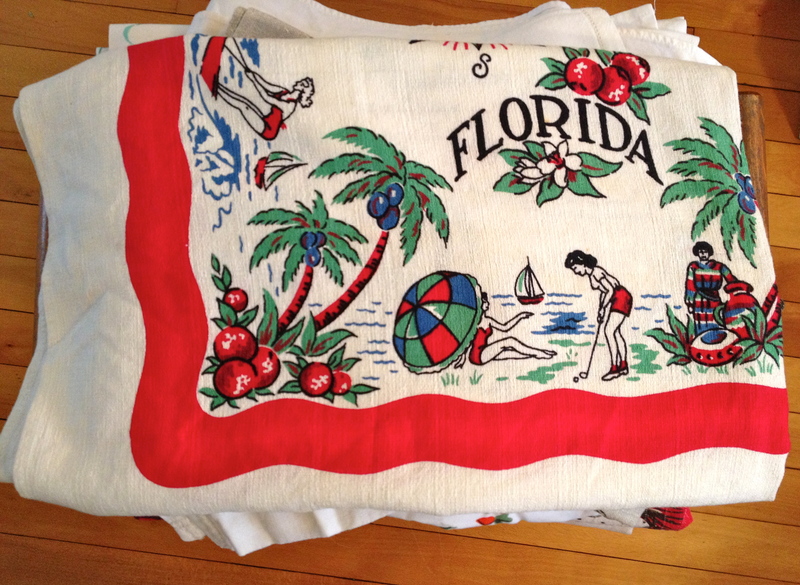 A linen towel with a great print and a recipe for bouillabaisse. Mmmmm, giant lobsters and crabs! And wine! 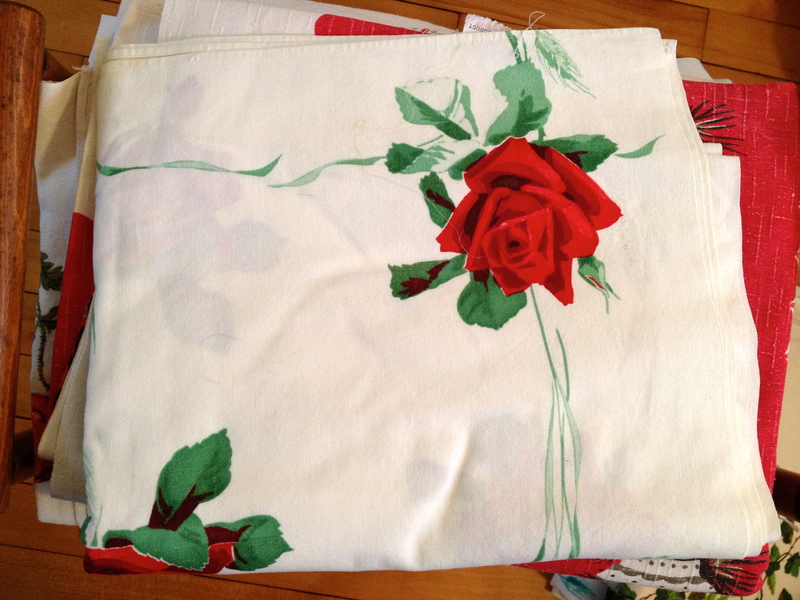 A huge Wilendur with red roses, and EIGHT matching napkins! Another huge (63 inches by 90 inches!) Wilendur, this time with green ivy. It’s got the original label still stapled on! Yes, another Wilendur with red roses. I got two, from different dealers. 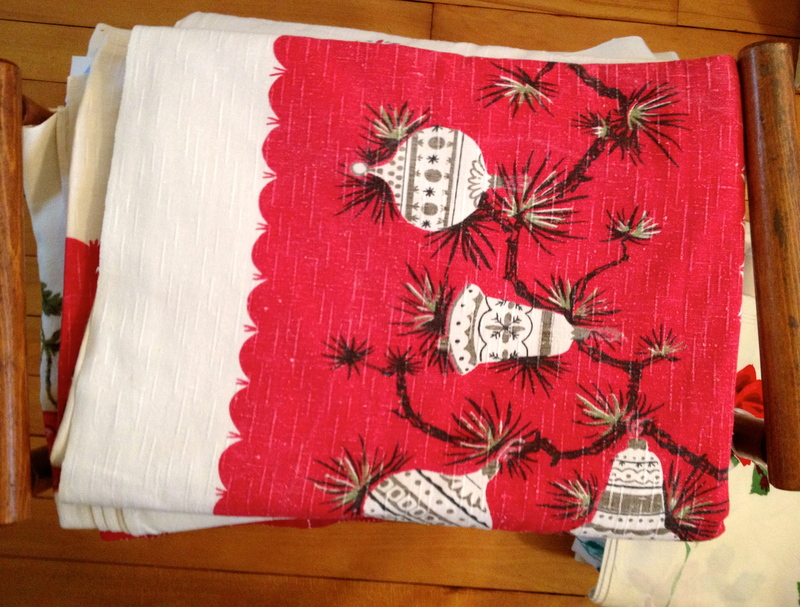 A linen Christmas cloth with a festive print that makes a big impact in only four colors: white, red, black, and metallic gold. 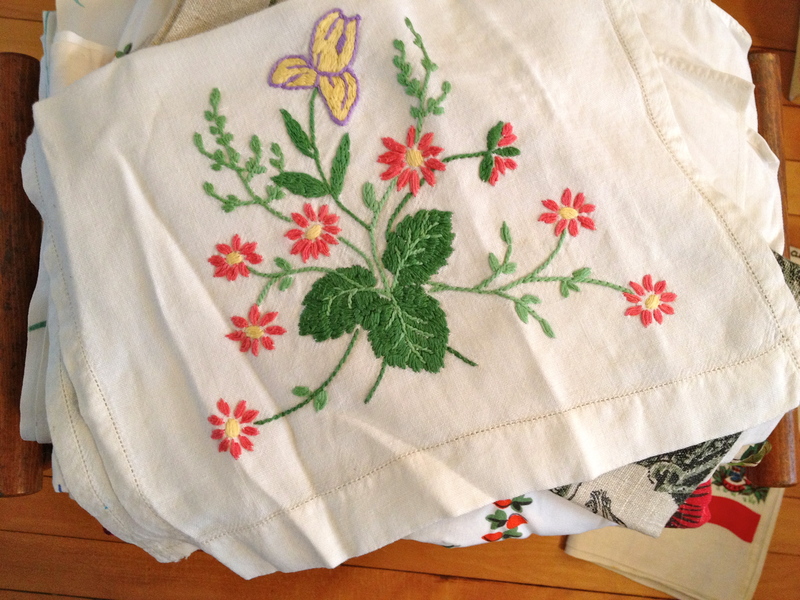 A floral linen tablecloth in very ’60s colors. 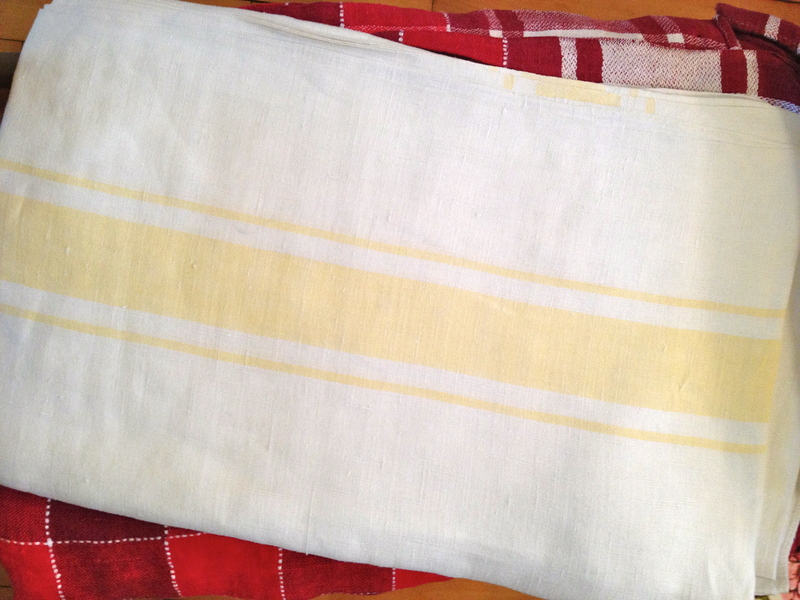 You could consider this the boring one of the bunch: white linen with yellow woven stripes along the long edges. Let’s call it . . . tasteful. When you need to impress the in-laws or the boss, this is the tablecloth you’ll probably pull out of the stack. 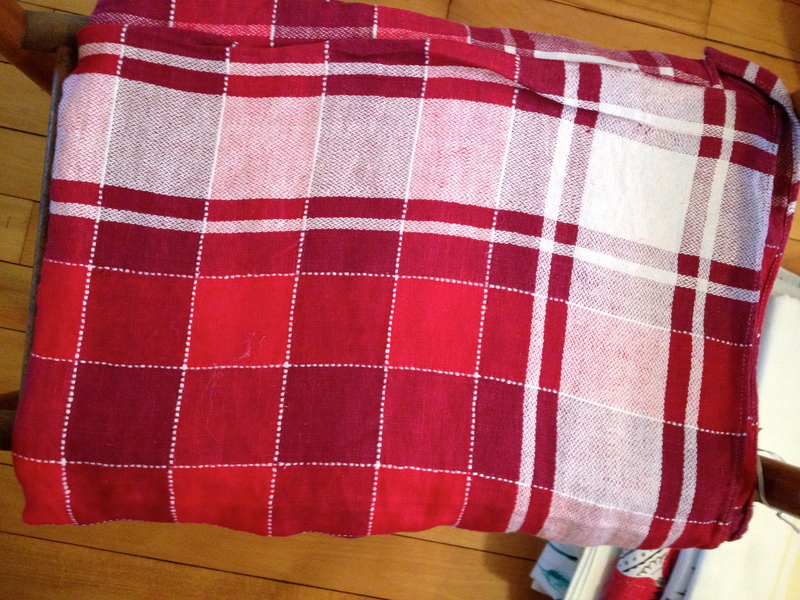 And the last one: a bold rayon plaid. I’m not sure this one is actually vintage but I liked the colors. And how long do you think it’ll take me to get them all laundered and ironed?! Oh, and hello there Nancy the Linens Lady! 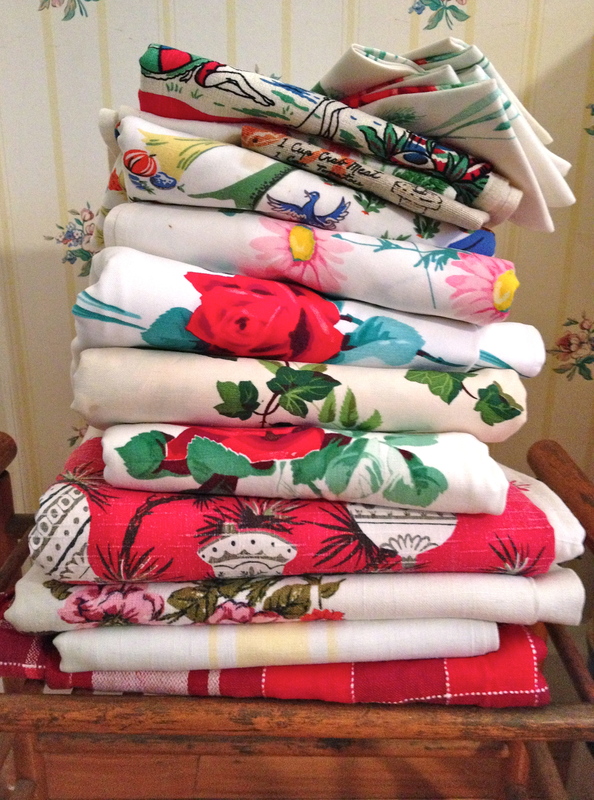 This little stack of tablecloths is nothing compared to the amazing things Nancy has. Go check her out! I missed you this time at the flea market, Nancy. I’ll catch up with you next time! Wowza! Okay, you win! 🙂 Love the ivy (which I could never use cause it’s got a tag…) and the red plaid! Nancy, I’m hoping to get to the Vintage Bazaar in November to see what’s new on your racks! The ivy one actually has the worst stains—-looks like a corner got wet. So I’ll need to take the label off anyway to soak it. Love your linens. Those are the things I always look for too. 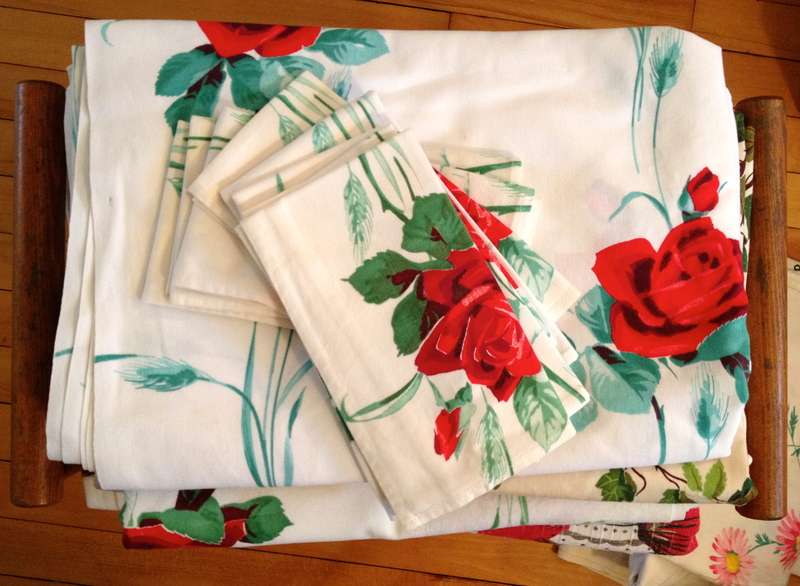 I was lucky with tablecloths this weekend too. I found a few but not as many as you did. The pink daisies are pretty. 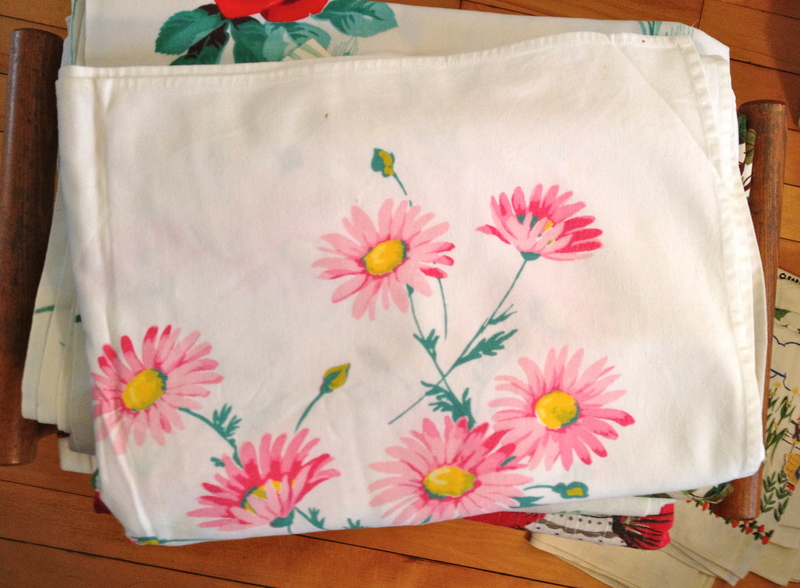 The pink daisies might be my favorite too—it is so cheerful!